BLOX Fender Washers UNIVERSAL - Dezod Motorsports Inc - Home of the automotive performance enthusiast since 2002. BLOX fender washers are precision CNC-machined from high quality, billet aluminum. Each is then anodized in eight brilliant finishes. The BLOX logo is cleverly etched on the underside so that the true beauty of the product is maximized. 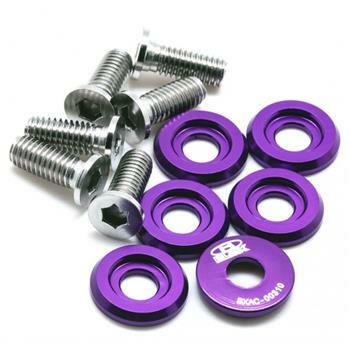 The BLOX fender washer kit includes 6-washers and stainless steel, M6 bolts. Kits are available in small and large diameters.